The construction of the artificial Federation Island started in summer 2012. It is located in the Black Sea, near the city of Sochi – the host of 2014 Winter Olympics. Like the UAE ‘world’ project it relates to the outline of the Russian Federation, ie the coast line of Russia. The resort is situated opposite Maly Akhun mountain, in the Khosta region of Sochi, 13 km away from Adler airport and 14 km from the central railway station. The islands will be connceted to the mainland via two vehicular tunnels and a footbridge and a port station. Federation Island will be more than 250 hectares in area and due to acommodate more than 40,000 guests at any one time. This artificial Russian archipelago is to be 2.5 km long by 1.5 km wide. Rotterdam/Moscow, 24 September 2007 – Erick van Egeraat presented his plans for Federation Island to the President of the Russian Federation, Mr Vladimir Putin. The presentation was held at the International Investment Forum 2007 in the future Olympic host city Sochi. Federation Island is a 330 ha artificial archipelago, located off the coast of Sochi, in the Russian Black Sea. The archipelago offers residences, hotels, cultural, leisure and recreational facilities. 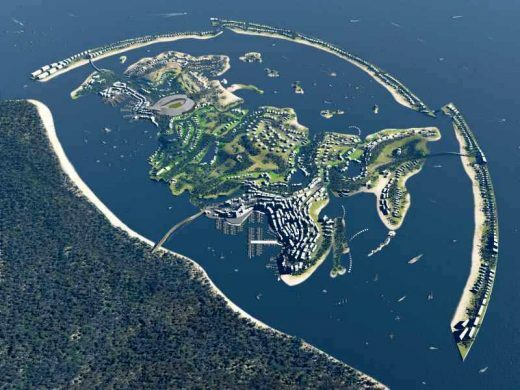 Federation Island will be built in the shape of the Russian Federation and reflects the country’s major geographical features. The Russian river network is used as a reference for the island’s waterways; the high mountains inspire the island relief. Federation Island comprises seven main, more than a dozen private and three breakwater islands. Sandy beaches, dunes, grasslands, bushes, small forests and riverside offer much variety for accommodation ranging from beach residences, luxury villas and apartments to dune, river and cliff houses. President Putin especially inquired about technical details and construction time. Erick van Egeraat assured that the Dutch experience in reclaiming land from the sea will benefit the project, which he considers to be unique among its kind. Federation Island is located 15 km from Sochi and the regional Adler airport. City, marina, airport and the skiing resort of Krasnaya Polyana can be easily reached from the archipelago. The region of Sochi has a humid subtropical climate with an average summer temperature of 25 to 28 degrees Celsius. The project is being developed by M-Industries of St. Petersburg and designed by Erick van Egeraat in co-operation with Dutch engineering companies Witteveen + Bos and Van Oord Dredging and Marine.